Glendora, CA - Having virtually grown up at Byron, B.J. 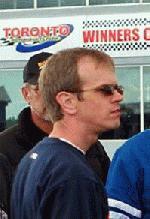 Vangsness has recently taken controlling interest of the Northern Illinois facility from long time promoter Ron Leek. Dubbed the “Playground of Power” Byron has more than 60 events scheduled with its first special coming up Sunday. Canfield, Can - For 2011, the schedule will remain centered around southern Ontario and western New York with twelve points races PLUS a non-points "open" and the first ever TNTSS Race Of Champions.